Wednesday the 10th April 2019 will probably be remembered as the day the only remaining right-wing component of the Conservative Party died. So what happened on that day? Well, Theresa May attended an EU Summit designed to keep Britain in the European Union despite her consistently promising over the past two years that ‘Brexit means Brexit’. The Summit made it clear that Britain, despite voting to leave, will have to take part in the European elections on May 23rd. But the day was just getting started…. Whilst the Prime Minister was quite frankly humiliating herself in front of the world’s media in Brussels, her own party and government sacked one of the West’s most prominent conservative thinkers and Philosophers – Roger Scruton. His ‘crime’, apparently, was that he had correctly stated that the word ‘Islamophobia’ was invented by the Muslim Brotherhood, in order to stop any criticism of Islam. George Osborne, the former ‘conservative’ Chancellor of the Exchequer, described this decision as ‘good’ on twitter. Scruton had been working as a housing tsar, drawing on his decades of experience to help the nation. However, it seems that appeasing the Islamic lobby’s demands is now more important than finding ways to build homes. The fact that the country is facing a housing crisis, and is in dire need of such expertise, seems to have flown over the heads of those in power. It was reported that the NUS (National Union of Students) had elected a certain Zamzam Ibrahim as their new leader. She was previously NUS leader at Salford University and supports students going on strike for free tuition, which is obviously a far-left position. She came to media attention in 2017 when her comments on various topics came to light. She called for an Islamic takeover in Britain: ‘The quaraan. We need an Islamic takeover’. 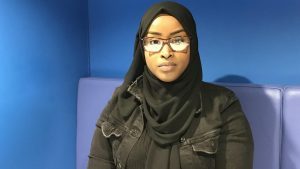 She also stated that men and women cannot be friends: ‘Maybe in some cases but Islamically it’s incorrect for girls to be friends with a guy anyway’. And then there was the tweet from her social media that brought the most attention: ‘I’d oppress white people just to give them a taste of what they put us through’. The fact that a majority white student union, which is overwhelmingly liberal and socialist, voted for an anti-white Islamist sympathiser to lead them is a sad metaphor for our times. It is one of those things which is baffling to comprehend, and yet these days is now such a common occurrence in our country. For the Conservative Party though, appeasing the Left’s narrative on Islam is getting them nowhere. Polls indicate that the party is dropping in the polls, perhaps by as much as 10% in swing seats. If this is accurate, then it would give Jeremy Corbyn the keys to Downing Street if an election was held. But is anybody really surprised? The Conservative Party has completely alienated its voter base, it’s MPs are facing deselection from their own party members, and Theresa May’s incompetent spell as Prime Minister has considerably lowered Britain’s standing in the world. Britain needs to change course, and fast.